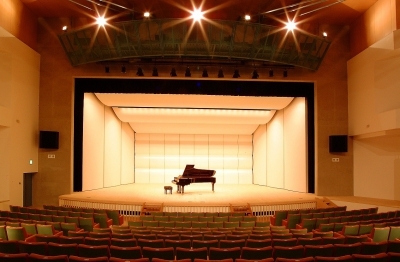 At Cultural Communication Center Hibiki, there is an auditorium which holds about 450 people, with great sound effects and a beautiful sparious area. They hold many cultural events all year round. 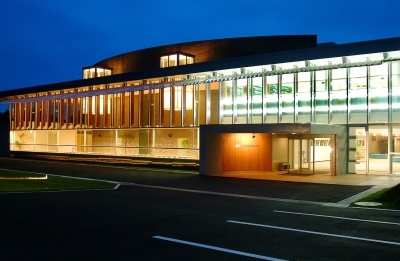 There are also many facilities such as conference rooms, library, exhibition space in Hibiki. This center is the place for lifelong learning. Anyone can use the center, so come visit us and communicate with each other at the foyer or the community hall with natural bright light. 30 minutes by bus from Kyushu Expressway Matsubase IC or Mifune IC. 45 minutes by bus from JR Matsubase Station, get off at Tomochi Chuo Bus Stop, and walk for 10 minutes. 1 hour 20 minutes by bus from Kotsu Center, get off at Tomochi Chuo Bus Stop, and walk for 10 minutes. Culture Hall with the capacity of 450 people, Library, Conference Room, Japanese-style room, Exhibition space are available.